SHIP BOTTOM, N.J. - Nov. 27, 2018 - PRLog -- The world was a very different place in 1914, but the founders of the Southern Ocean County Chamber of Commerce had the foresight to establish an organization that would represent the business community locally, regionally, nationally and internationally. Since its early years as the Long Beach Island Board of Trade, the businesses of the area has gathered to support innovate initiatives that help bring commerce into the region. Headquartered in Ship Bottom and sitting on the gateway to the island, the Chamber's mission is to foster positive growth, while enhancing life for visitors and residents alike. Dating back to May 1914, businesses saw the need to work together to provide the best possible environment to all who come to our shores. "The Southern Ocean County Chamber of Commerce brings business people together to make great things happen" states Lori Pepenella, CEO. "The determination of local business leadership has made a remarkable impact on shaping our region". The highlights from the organization is many, including responsible growth of infrastructure from schools, roads, and the introduction of automobile bridges in 1914 and 1959.. From creating the first tourism promotional brochures in 1938, opening the doors to its visitor center in 1942, creating Miss Magic Long Beach Island in 1958, starting Chowderfest in 1989, going online with the area's premiere information website in 1996, and planned the first Wedding Road Show in 2009 which has rebranded the region as a wedding destination over the course of the past decade. In 2010, it was first to champion the Shop Small Saturday Movement to its members, which has now grown Thanksgiving Weekend demand substantially. In 2014 it became a globally accredited Destination Marketing and Management Organization, one of 200 across the world. In 2017 it partnered with the Office of Homeland Security to bring the first Hometown Security Seminar for businesses in time for the busy summer season and also created the first POP UP chamber meetings to showcase vacant commercial space. In 2018, it established the first brew trail in the state and the first in country to include non-alcohol stops. Currently the Southern Ocean Chamber Board of Directors and staff oversee an organization that is responsible for running a year round visitor center that highlights information for business members. The Chamber packs in several opportunities each month for business development, networking and membership meetings. It holds serves as the region's Public Relations clearinghouse issuing multiple press releases each month, placing ads in target markets and creating content to feed its social and digital platforms that reach over 40K consumers daily. Since 2005, as one of the many responses to Super Storm Sandy recovery, it collaborated with WBNJ and aired their award winning LBI Region Report weekly radio show. The organization maintains the region's website www.visitLBIregion.com as well as chowderfest.com and southernoceanmade.com; publishes the main fulfillment piece; the Land & Sea Guide, and is on every social media platform as either LBI Region or Southern Ocean County Chamber. 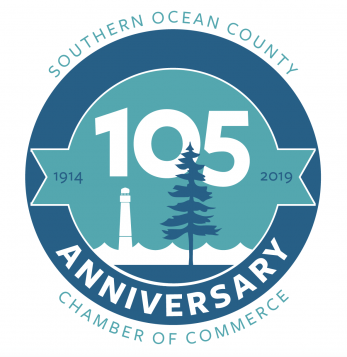 In addition to funding local projects and raising money for scholarships, the Southern Ocean County Chamber also assembled a Business Development Council to help with positive planning for the area which launched the current 2020 Vision Strategic Plan that lead to Downtown Driven Ferry Project, investing in regional economic and tourism research, as well as the Open for Business, Women in Business, Founded in Family and Southern Ocean Made Programs. The 105 committee has created special #thrivein105 events throughout the anniversary year. Please go to www.visitLBIregion.com , contact chamber at 609 494 7211 or stop into their center at 265 W Ninth Street Ship Bottom to find out more.